1 Ler Shee survived. The 12-year-old boy survived a horrific catastrophe. He survived the loss of his immediate family. He survived Cyclone Nargis. Cyclone Nargis hit Asia in May 2008. It was the deadliest cyclone to hit this area since 1991. A cyclone is similar to a hurricane. It is a storm with a quiet center that is surrounded by strong, destructive winds. The cyclone was particularly devastating to the southern part of Ler Shee's country, Myanmar. In fact, the most severe destruction occurred in the Irrawaddy delta region, a place Ler Shee called home. 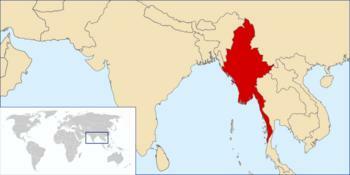 2 Myanmar, or Burma, is an underdeveloped country. The government is ruled by an authoritarian military regime. The government suppresses anyone who is against it. There's even a law that makes it illegal to gather in groups of more than five people. Even peaceful demonstrations are illegal. Medical care is quite inadequate, even for routine care. In 2008, it was estimated that approximately 48 million people were living in Myanmar. 3 Cyclone Nargis was quite obviously devastating in a country that was struggling to begin with. According to the United Nations, Cyclone Nargis killed more than 138,000 people. It also left over two million people needing food, shelter, and medical care. The infrastructure in many areas was destroyed. 1. Research what a cyclone is. 3. Create an imaginary relief organization. What is its purpose? How does it help and respond to disasters? 4. Compare Myanmar's government to that of the United States.